And who could ever doubt Google? See you on September 6th!! God bless Google. See you at The Rack? I just tried it myself and it totally came up with a plethora of Ohio State links, including www.osu.edu. Hmmm.. that's interesting. 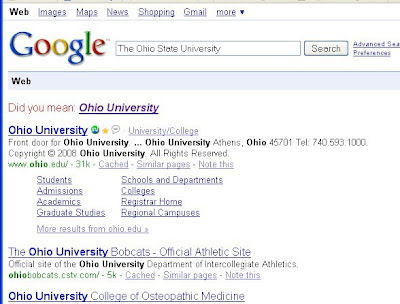 I wonder how my searches keep coming up Ohio University? Maybe my spam blocker is on. OU is THE state university of Ohio, by date!